The Resort at Marina Village - We took our first vacation at this Cape Coral luxury resort and had a blast! 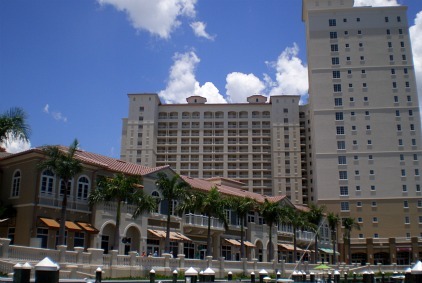 It is now owned by Westin Hotels and is known as the Westin Cape Coral Resort at Marina Village. Marina Village is on the water and you can't beat the views of Cape Coral and a nature preserve, the Caloosahatchee River, Ft Myers, and Sanibel. 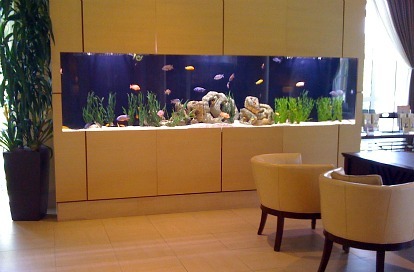 The luxury begins when you enter the inviting lobby, it has a dramatic tubular fountain, designer seating, and large aquarium. We got ourselves a studio, which had 2 double beds, and the room was sooooooooo nice. 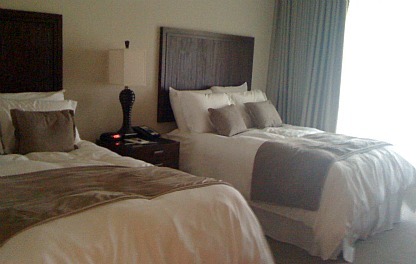 We were very comfortable, and our beds had luxurious bed poofs and linens. Each studio has a convenient kitchenette with mini-fridge, cabinets and dishes. The bathroom was gorgeous, I really liked the granite counters, tiled shower, and the towels were soft and thick. We were on the 10th floor and the views of the Preserve and Cape Coral were terrific! I love the pool at The Resort at Marina Village! It's right on the river, has splashing fountains, a hot tub, and music playing ..... perfect for relaxing. Christine, their pool attendant, is amazing and will take good care of you. Order beverages, snacks, and suntan lotion from her and she will help you with anything you might need. You can also use a lap pool and a lagoon pool tennis, and bocce ball next door at Tarpon Point. A kiddie camp is set up next to the pool for kids to do crafts and other activities. The resort offers bikes for your use, and you can also rent kayaks. Included in the price of your stay is a boat taxi ride over to Ft Myers Beach. Another fun thing to do is take the resort's sunset and dolphin cruises. We went on the dolphin cruise and got to see lots of dolphins, especially over by Sanibel. Moving on to the resort's restaurants, Marker 92 is a bar and bistro, with casual fine dining and seating inside or out. 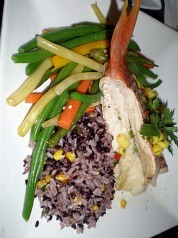 The restaurant's chef likes to use fresh, local ingredients for the best flavor. The Nauti Mermaid is a dockside bar and grill with more casual fare. The good thing is you can order from either menu no matter where you sit. Personally, I would get the grilled grouper sandwich or salad, or steaks and seafood dishes! Esterra Spa. I had a hot stone massage there, very relaxing ......... it was amazing! We think you will want to come back again and again, just like we did ..... so, check out the photos and videos of our second vacation at Marina Village Cape Coral! 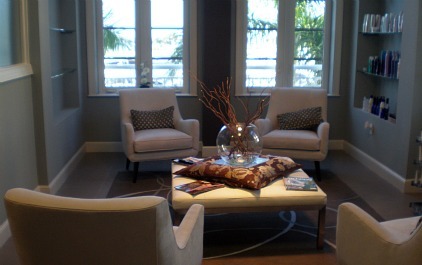 You will also want to see my new page about the resort, Westin Cape Coral.